Keep artisanal cheese fresher for longer with a cheese storage container. Unlike wrapping in plastic, the silicone lid-and-base-combo is designed to wick moisture away from cheese, thwarting mold from developing and preserving flavor. There’s a divider to keep different cheeses separate and the container can be written on to label what’s inside. Dimensions: 6" x 4" x 3.5"
We are cheese lovers. This was a great find we are very pleased wit this product. Artisanal cheeses are best kept in a cheese storage container, but many of us don’t do it the right way. (Hint: plastic wrap is not the right way.) The Cheese Vault, however, is the right way. It is designed to let cheese breathe, which is the key to prolonging its freshness and preserving its flavor. The silicone lid and base wick moisture away from cheese, thwarting mold from developing. Silicone is dishwasher-safe and won’t harbor cheese-y smells or absorb other odors lingering in the fridge. 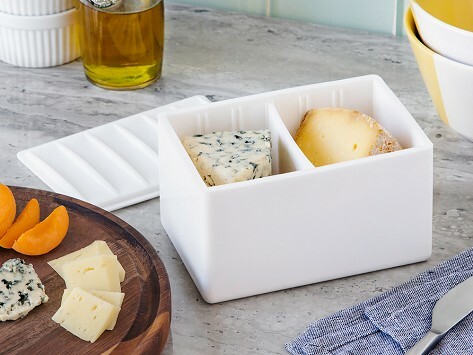 There’s a divider to keep different cheeses separate and the ends are writable—to note a cheese type, purchase date, or to pen a friendly hands-off warning.